Local Transport Minister Norman Baker says the Government is determined to help more people take up cycling. Roads Minister Danny Kennedy has outlined plans for a cycling revolution in Northern Ireland. A smartphone app that allows users to report potholes has been revamped. Roads Minister Robert Goodwill has agreed to consider amendments to the new Infrastructure Bill that would ensure cycling was included in the remit of the proposed restructured Highways Agency. Plans for a new road bridge over the River Thames that would link Beckton and Thamesmead at Gallions Reach have been unveiled. More than half of British adults surveyed in a poll carried out by the BBC believe their local roads are too dangerous to cycle on. Work on London’s first fully segregated cycle-friendly roundabout has started in Wandsworth this week. A new cycle safety system that has been trialled by lorry drivers in Ealing has helped prevent 15 potential serious collisions in six months. The Department for Transport (DfT) has outlined plans to double participation in cycling by 2025. The biggest single investment in cycling will be unveiled by the government today (27 November 2014). Guidance on the provision of high quality walking and cycling routes in Wales has been unveiled by the Welsh government today (9 December 2014). Work has started on a substantial upgrade of Cycle Superhighway 2 (CS2) in London. There were almost 23,000 cyclist accidents in Greater London between 2009-2013, according to data analysis conducted by Aviva. The Mayor of London Boris Johnson has marked the start of work on London’s first segregated Cycle Superhighway after helping to dig out the first tarmac. Work is due to begin on the final phase of a cycle and pedestrian route at Rye Harbour in East Sussex. VolkerHighways has started work on London’s Cycle Superhighway 1 (CS1) on behalf of Transport for London (TfL). The Department for Transport (DfT) is making it easier for towns and cities to host future Tour de France stages and other elite cycling events in England. Geoffrey Osborne has been awarded a £2 million contract to build or upgrade 17 cycling paths at sites across the East of England including the A12, A120, A47, and the A5. Highways England has started work on more than 40 cycling schemes that will make it easier for cyclists to cross motorway junctions and use major A-roads. Plans to make walking and cycling the preferred method of travelling for shorter journeys in Wales have been published by Transport Minister Edwina Hart. The government has launched a blueprint to encourage more people to walk and cycle. National cycling charity CTC has warned that Britain won’t reach current Dutch levels of cycling facilities and investment until the 23rd century. 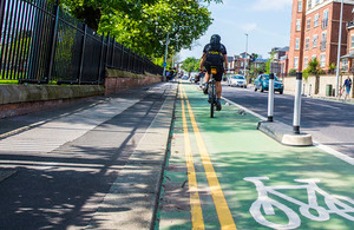 Councils across the country have won almost £21 million of funding from the government to promote green forms of transport, including cycling and walking. Gloucestershire County Council has helped to fund a Highways England study which could see a cycle-superhighway built between Gloucester and Cheltenham. A shared cycle and footpath is being built alongside the A585 in Lancashire at a cost of £1.5 million. A coroner has called on Transport for London to urgently review its cycle superhighways to identify areas of reduced grip, stating "there is a risk of future deaths" unless action is taken. The Department for Transport (DfT) has appointed WSP to revise and update its cycling infrastructure design guidance.